Should Your First Home Be a Condo or a House? June 22nd Anthony Lamacchia announced several management changes and promotions to properly handle the explosive growth the company is experiencing and expecting to continue. Year to date the company’s business is up 70% over last year at the exact same time. In addition, several new agents have joined the company in many different areas and since the first of the year, the headcount has doubled. Many additional agents are scheduled to come in in the months to come. Sarah Chaisson who was the company’s very first employee and was previously the Director of Operations is now the companies Vice President. Angela Walker who started at the company back in 2009 has served as the Listing Manager since 2010 is now the Director of Operations companywide. Mike McGrory who started at the company in 2008 and has served as Listing Sales Manager since 2010 is now the Director of Sales companywide. Nicole Pirnie who joined the company in early 2013 and has served as Agent Development Manager with a focus on buyer sales is now Director of Growth and Development. Dave Karoly started at Lamacchia in early 2010 and exceled in numerous positions including Inside Sales and was the company’s most successful listing sales agent. Due to his experience and success he has been promoted to Manager of Sales for the entire company. Sabrina Vazquez who started at the company as a Sales Assistant followed by a stint in reception and over the last few years has been a Listing Assistant is now the Manager of Administrative Assistants companywide at all locations. Lindsay Thompson joined the company in February as Marketing Manager and is responsible for branding, advertising, marketing properties and all lead generating initiatives. Adam Mason joined the company in March 2016 as the Rental Manager and has been building out and managing the Rental Division of the company in and around Waltham and Watertown. “I am very fortunate to have such a devoted team to work with me and run the company. I am grateful to have them all. In addition, I am also very proud of each and every one of them. Watching them grow in their careers has been very satisfying,” said Lamacchia. Up until a few years ago the company only consisted of a powerful real estate team. 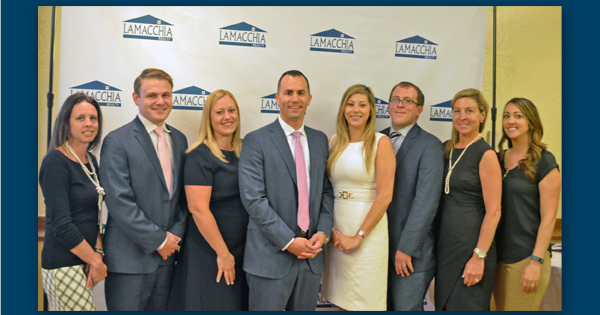 Over the last two years Anthony Lamacchia has put tremendous time into transitioning the company into a more traditional brokerage in addition to the powerful team, which has been one of the top 50 teams in the country since 2012. Since last year when the company rebranded to just Lamacchia Realty there has been a lot of growth. The company headquarters is in Waltham which was the only location until the August 2015 opening of the Westford location. Over the winter of 2016 Adam Mason joined the company to build out a rental division in Waltham and Watertown. In May 2016, the third Lamacchia Realty location was added in Woburn with that markets top agents. On June 1st, the company announced their affiliation with Leading Real Estate Companies of the World® and in July 2016 they announced their most recent opening of an office in Worcester where the market share will only continue to grow. “The growth we are experiencing and the transformation we have made over the last couple of years made these changes necessary. I always want to be sure that we have the proper people in place to run the company and assist the agents so that they can grow to their fullest potential. With these new changes we still have both,” stated Anthony Lamacchia. Lamacchia Realty prides itself on the substantial amount of ‘in the trenches’ and REAL Training that it provides to its agents on a weekly basis. No other company provides such ground level interactive training as Lamacchia Realty. All of the management changes and a number of other company initiatives were announced by Anthony Lamacchia earlier today at a company event at Café Escadrille in Burlington MA.